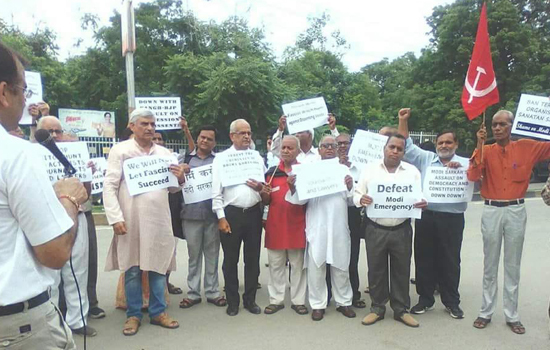 Udaipur:A public protest was staged on Thursday,30th August in front of the Collector's Office , Udaipur to oppose the unlawful arrest of Human Right Activists, Writers, poets and Lawyers in different parts of the country by Maharasthtra Police in connection with Bhima-Koregaon violence in the month of January. The left parties including Communist Party of India, Communist Party of India (Marxist), Communist Party of India (ML) Liberation ,Janta Dal (S) and Loktantrik Adhikarevam SadbhavanaManch along with writers, poets, journalists and university professors participated in the protest demonstration. A memorandum addressed to the President of India was submitted to the district administration demanding immediate release of those arrested and withdrawal of all cases registered against them. Addressing the gathering at the demonstration Rajesh Singhvi, city secretary of CPIM said that the government has not arrested the real accused mentioned in the FIR related to Bhima- Koregaon incident but has arrested those who were not even remotely connected with the violence there. He said that this step is taken just to frighten people who are supporting the poor, tribals and dalits in the country. State Committee member of CPI(ML) ShankerLalChaudhary said that it is an attempt to intimidate those who are standing in support of the tribal population against the plunder of natural resources by the corporate. Almost all the human rights activists have been forced to move out of Jharkhand and Chhattisgarh. He said that the present regime is a fascist regime which needs to be thrown out of power. Journalist Himmat Seth said that it is a bid to silence the dissenting voices. There is a need to support them because it is not an attack on one , two or five individuals , but it is an attack on democracy. Poet, journalist and professor of English Dr. HemendraChandalia said that the arrest of poets , professors and activists is an attack on the constitution of India. Those who want to change the constitution and make India a Hindu state are playing this conspiratorial game. He said that the idea of connecting the names of people like SudhaBhardwaj and VarvaraRao with an attempt to kill the Prime Minister is ridiculous. It is a lame excuse to create an atmosphere of horror and suppress the voice of reason. Former secretary of People's Union of Civil Liberties Advocate ArunVyas said that the step taken by the government is worse than Emergency. It is a state of undeclared emergency.Secretary of CPI Mahesh Sharma, Founder of BhrashtacharMukt Bharat Harish Suhalka, District secretary of CPIM Pratap Singh Deora , secretary of CITU Shamsher Singh Nandwani, dalit activist P.R.Salvi, PremlataChaudhary, secretary AIPWA, Piyush Joshi, Diploma Engineers Union, B.L.Chanwal of KisanSabha, RamChandraSalvi of JD (S), Guman Singh Rao, Prof. L.R.Patel, Advocate Ramesh Nandwana , President PUCL and many other activists and people from democratic rights organizations participated in the demonstration.